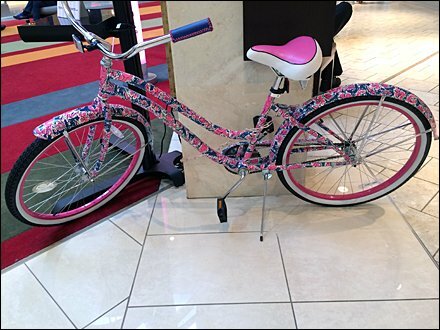 A custom pink paint job makes this a one-of-a-kind raffle offering of a Lilly Pulitzer Bike. It would bring a bit of joy to someone while heightening awareness of a serious cause, Breast Cancer. Though moved around the mall in an impromptu fashion, I think it could have been enshrined on an elevated pedestal for even greater effect. But in any event it is lock-and-chained to a concrete concourse pylon. CLICK the gallery to browse the bike and offer.